Fortune, it is said, favours the brave. For the better part of the ninety minutes, the Vietnamese bossed the ball as they did that chilly night in Hanoi almost two years ago. They knocked it efficiently like a well-oiled machine backwards, square and to the sides. But where it mattered, the Vietnamese were found wanting. Smaller on average in stature compared to the Philippine team, the Vietnamese were hesitant to earn their money inside the box where the towering Filipino defenders held fort. At the other end, thrown into the fray late in the game was the diminutive Filipino talisman, Emelio ‘Chieffy’ Caligdong. Where the Vietnamese were afraid to venture, the Air Force man held no such reservations. 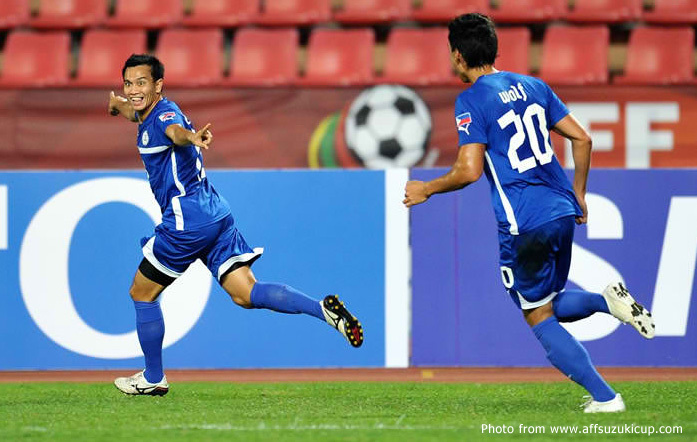 Drifting into the left side of the penalty box in the 85th minute, Caligdong collected a lofted pass by Angel Guirado, settled himself down and then fired the winning goal into the Vietnamese net. Roused from their lethargy and realising that Caligdong’s goal could very well be their quick ticket back to Hanoi, the Vietnamese finally ventured inside the box in search of a quick equaliser. They nearly got it just one minute later; except that the excellent Eduard Sacapaño in the Philippines goal got his fingers to the ball to push it against the bar and back into play. This tournament has been a totally different experience to the one in Hanoi two years ago, when the Philippines were rank outsiders and probably not taken seriously by the opposition. The weight of expectations has not been kind to the players and it has shown over the two matches. There was, it has to be said, stark romanticism in that in a team made up of individuals who learned their football in various parts of the globe, the only two homegrown players on the pitch were the ones who ensured that the fairy tale continues. In a way, this game was like a mirror. Two teams looked at each other; and what one saw was almost an image of its own self. Both teams were coming from their own respective less than desirable opening day performances; and consequently approached the game as though treading on glass. A result for either team could mean tragedy for the other; and so the pressure weighed down heavily on the shoulders of both sets of players. Thus, the match was littered with schoolboy errant passes by both teams, the sort one does not associate with full internationals. It also mirrored the one in Hanoi that forever changed football in the Philippines. Although the Philippines started the game on the front foot, once the Vietnamese started to gain some fluency with their passing patterns, the Filipinos’ best work was done protecting Sacapaño’s goal. As they were in Hanoi, the Vietnamese were limited to taking hopeful shots from distance which mostly sailed harmlessly above the goal. When they were on target, Sacapaño was faultless with his catching. 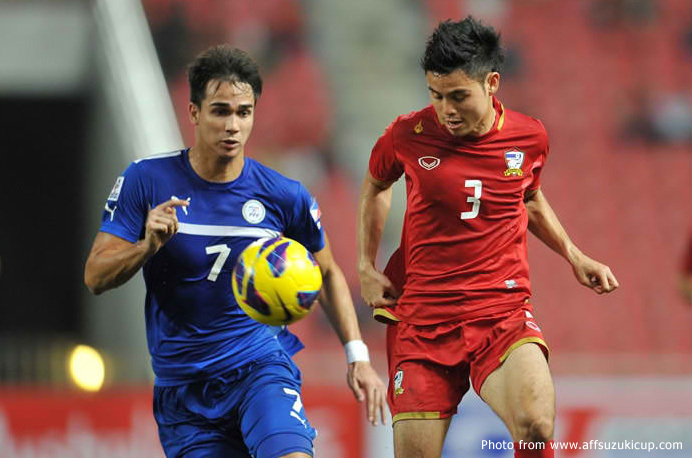 Things might have been different had Phil Younghusband scored from a delightful chance laid on the table for him by his brother James in the 11th minute. Rounding a Vietnamese defender, James cut the ball back only for Phil, who had time to settle himself, to completely mishit the ball. It was, in fact, a miserable night for the Philippines’ top marksman, who did not play with his usual self-belief. In fact, years from now, Phil will probably remember the match more for all the wrong reasons. First, a raised elbow as he went for a header bloodied an opponent’s forehead. It would have been poetic justice had the forehead been Thai. Next, his dive to try to fish for a penalty in the 27th minute was not only utterly lacking in grace; it also earned him a deserved yellow card. As things were, the match was dour for long stretches and aching for a spark that could inject some life to it. The spark came, late in the game, in the form of substitutes Angel Guirado and Caligdong. Guirado is the sort of player who can turn from the dazzling to the asinine all within the space of minutes. Tonight, however, Guirado was only at his dazzling best. In the 75th minute, his return of a 1-2 to Caligdong was sublime, catching almost the entire Vietnamese backline wrong-footed. The Air Force man delayed his shot just a fraction of a second; enough time, at any rate, for the Vietnamese to clear. Two minutes later, it was the turn of Caligdong to reciprocate, sending in a cross from the left wing which Guirado headed into the arms of the Vietnamese goalkeeper. The cross was too low for Guirado, whose header lacked sting. 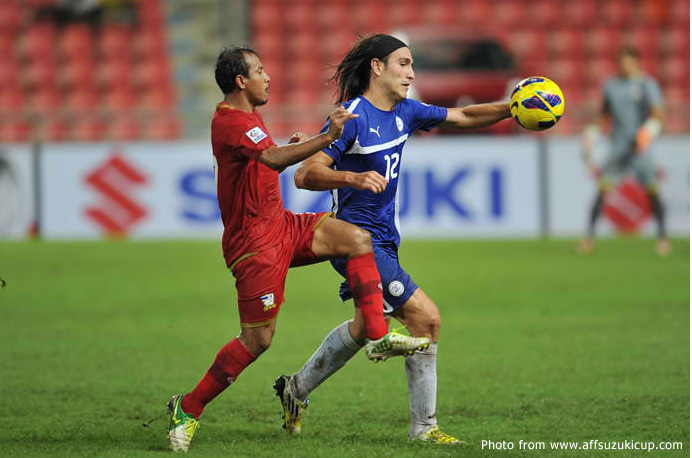 In the 81st minute, Guirado embarked on a glorious run from almost the halfway line into the Vietnamese penalty box. He nonchalantly cast aside the close attentions of a Vietnamese defender and strutted past two more before shooting. Unfortunately, the shot was blocked. Just four more minutes would elapse before Caligdong would deliver what would ultimately be the deciding solitary goal, ruthless and deflating as it could possibly be because it asked the Vietnamese to do what they failed to in 85 minutes. However, the slow start may yet be propitious, after all; and all indications are that the Philippines’ form is slowly starting to rise. The spring in the players’ steps after Caligdong’s goal, for instance, was unmistakable. 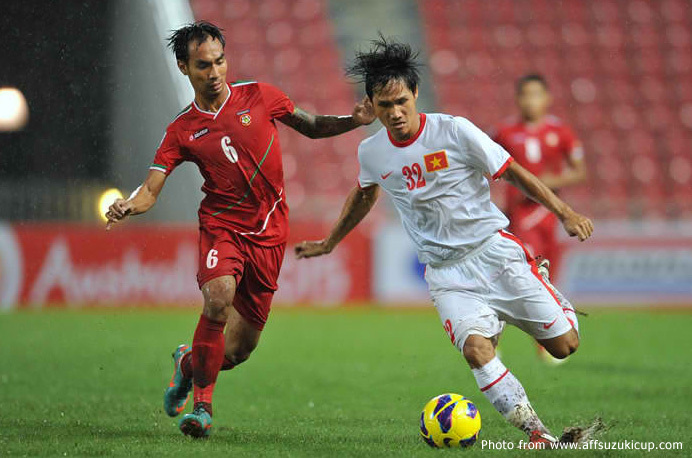 If we can get past Myanmar into the knockout stages, the team may peak just at the right time. Just a word about the Vietnamese players, who approached the Philippines’ coaching staff to shake hands at the end of the match. Sometimes, you do not have to win to be pure class.